The school bell has rung and it’s time for another new year — how is your little one adjusting to the new schedule? Your orthodontist in South Hills of Pittsburgh, Dr. Gary Cartwright, knows August can be a tough transition time for little ones, and their dental health and hygiene may fall by the wayside during the adjustment phase. Our team has put together a checklist to help make sure they stay happy and healthy for another successful school year! Keep reading for our top 5 back-to-school smile tips. Lunchtime and afterschool snacking is a big deal for kids, and cookies, chips, and candy are usually favorites. Of course, you also know these items aren’t so good for their bodies or mouths. Sugar combines with the bacteria that’s naturally present in our mouths to eat away at the tooth enamel, causing cavities and infection. So why don’t you try for smarter snacking this school year? Do a little research and maybe some trial and error to stock your shelves and their lunchboxes with items that are nutritious and delicious. Some of our favorites are ants on a log, lowfat cheese sticks, yogurt (watch out for high sugar content, though), and whole fruits and nuts. Sleep is so important for growing bodies and minds, but it can be hard to adjust to the earlier wake-ups and bedtimes in August and September. Help make it easier for your child to fall asleep at night by encouraging them to reduce screen time in the hour or two before going to bed, avoiding caffeine and sugar in the afternoon and evening, and staying on the same schedule over the weekend, too. While you’re getting your little one on track for a successful school year, make sure their brushing and flossing habits stay on track too. If you meet reluctance — most kids need a little encouragement in this department — try adopting a progress chart. Every evening and morning they brush/floss properly, add a star. Set small rewards, like a family movie night or a new book, for a week or month of dedicated dental hygiene. If your kiddo is involved in contact sports, make sure you’re protecting their teeth and gums with a custom-fitted mouthguard. Sports injuries are the most common reason for dental emergencies, but this small piece of plastic provides significant protection for your favorite smile. Studies even show that using a custom-fitted mouthguard can reduce the risk of concussion. 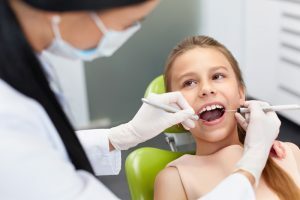 And last but not least, back to school season is a perfect time to get your child’s bite alignment checked out. Getting braces is a rite of passage for kiddos — and straight teeth promote lasting oral health and wellness for a lifetime to come. Children should have an orthodontic consultation by the time they are 7 years old. We invite you to go ahead and schedule a visit with your South Hills of Pittsburgh orthodontist today!